So sorry for the late update folks! I was having such a blast chillin’ with my forex buds in my Happy Comdoll Corners. Come and join us if you wanna talk comdolls, too! Anyway, I closed this USD/CAD trade before the week ended because I didn’t want to wake up to any surprises (again) on the next trading day. I was able to close the rest of my position at the .9820 mark, just where my first profit target was. I ended up with 90 pips on this long trade, for a total of 0.5% gain on my account. Not bad, huh? I could’ve ended up with a loss with the way USD/CAD dropped today! I heard that Canada‘s CPI printed the highest in 8 years! At least that put an end to my losing streak. And I’m crossing my fingers that this will be the start of my winning streak. But before I take new trades this week, I would like to credit my forum buddies, most especially my newest BFF SimonTemplar, for giving feedback on my trade ideas. Let’s keep the ideas coming, everyone! If you’re still shy to post on the forums (although you really shouldn’t be! ), you can hit me up on my @Happy_pip Twitter account and my Playing with Comdolls Facebook page as well. I’d really like to catch another win this week and I know you guys can help me. I finally found a trade idea that worked! Thanks to my friends in my Happy Corner for Loonie pairs, I was able to lock in 90 pips and even move my stop loss to break even. 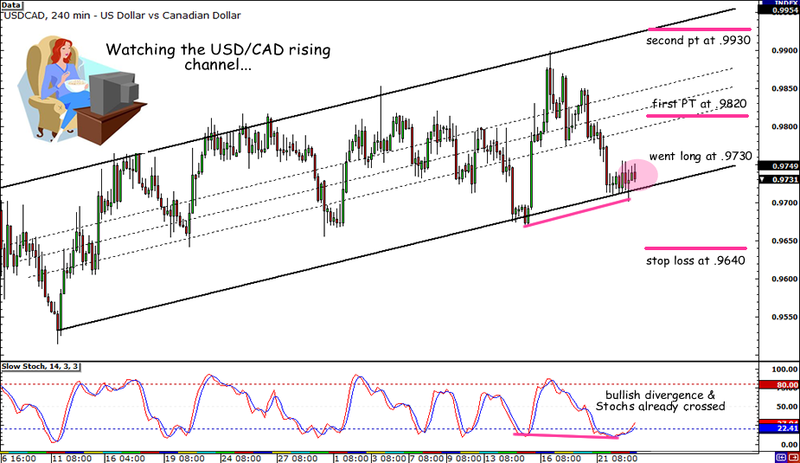 As I mentioned yesterday, I bought USD/CAD at .9730 as it is near the support of the rising channel on the 4-hour chart. I originally placed my stop at .9640, with my first profit target at .9820 and my second one at .9930. Good thing my plan is working out so far! Even though risk appetite suddenly rebounded yesterday, poor economic data from China, Europe, and even the U.S. provided the low-yielding dollar support. What’s more, the International Energy Agency announced that it would release 60 million barrels of oil next month to make up for the lost supply from oil disruptions in Libya. If that doesn’t scream Loonie bearish, I don’t know what else will! As happy as I am about my win, I still have to be careful on my remaining position. I already moved my stop to break-even, and now I have 0.5% left until the pair (hopefully) reaches .9930. So do you think I’ll hit my second profit target anytime soon? News reports tell me I could, but I can’t be too sure. Maybe all I need is another night out with my girls to clear my mind. Does Green Lantern sound good, or do you have other recommendations? Don’t hesitate to hit me up on my @Happy_pip Twitter account and Playing with Comdolls Facebook page! Oh, and if you’re the forum-type of guy or gal, you can also reach me through any of my Happy Comdoll Corners. I’m back! 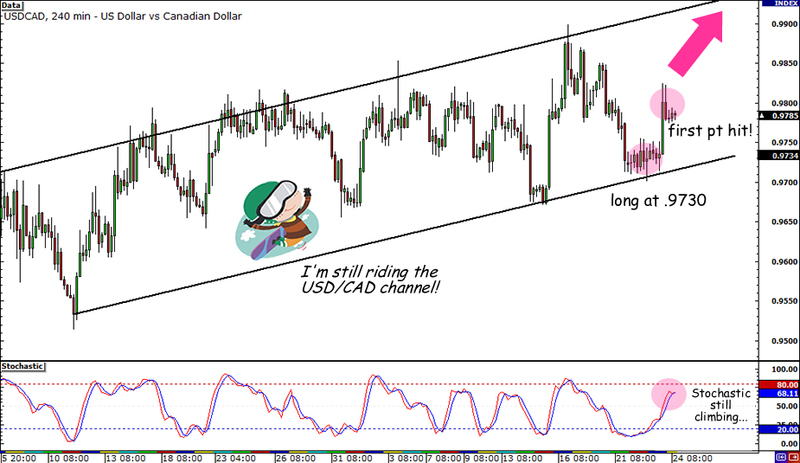 And this time I have a long USD/CAD setup with me! Thanks to my friends in my Happy Corner for Loonie pairs, I decided to go long USD/CAD this week. If you’ve missed our discussion, I should tell you that my friends and I have been talking about USD/CAD’s bullish pattern. 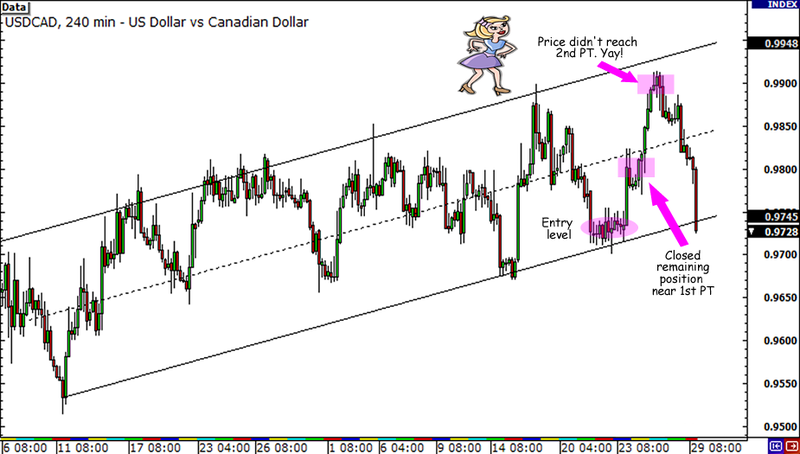 As you can see, USD/CAD has been lollygagging along a rising channel on the 4-hour chart. Also, a bullish divergence had formed yesterday, but I decided to wait for Stochastic to cross and move out of the oversold region. I’m following the 9 Rules for Trading Divergences after all! As for the FUNdamental side of the trade, I figured that the FOMC statement was relatively upbeat, which can provide USD a lift in the next trading sessions. Recall that Bernanke mentioned that they’ll keep rates on hold for at least 2-3 more meetings. Over in Canada we saw weak retail sales figures the other day but the impact on CAD was muted because of Fitch’s warning concerning the US. What’s more, BOC Govenor Carney expressed his concern for the strong CAD, saying that its hurting Canadian exports…again. I already got triggered at .9730 early today, and I placed my stop just below last week’s low and the .9700 major psychological support. For my profit levels, I decided to listen to Simon Templar from the forums and set my first target in the middle of the channel, with my second profit target near the top. So do you think my trade idea would work this time? Don’t hesitate to give me a shoutout in one of my Happy Corners! If you’re the shy type though, you can always reach me through my @Happy_pip Twitter account, or my Playing with Comdolls Facebook page.